GM Hopes Volt Charges Up Other Model Sales As it prepares to roll out its new electric vehicle, General Motors knows it may not attract many sales at first. But the automaker hopes the buzz will draw customers to its showrooms and boost sales of the Chevy Cruze or other models. 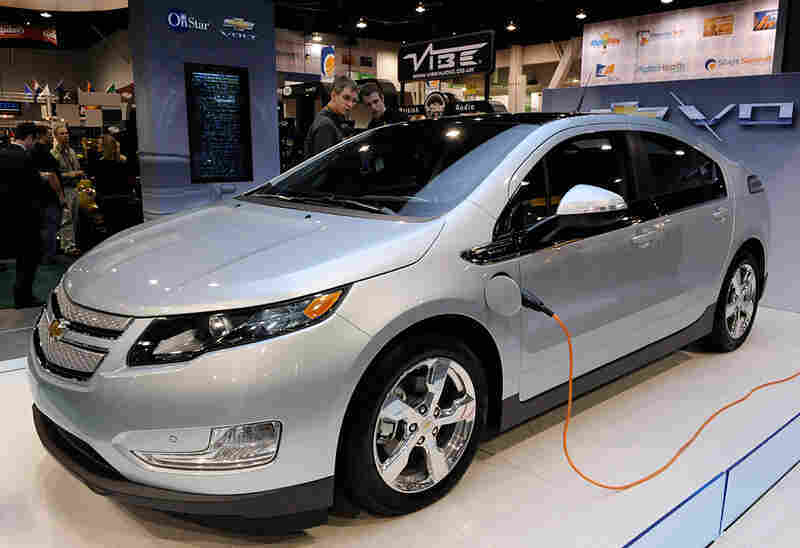 The Chevy Volt will retail for $41,000 — but tax credits will reduce the cost. What do you get from an image-battered Detroit automaker whose prestige could largely ride on the launch of one revolutionary car -- one that's likely to lose money for years to come? You get the much ballyhooed Chevy Volt. There are high expectations for this car, which General Motors hopes will become America's pre-eminent green vehicle. Ten of GM's precious pre-production Volts are lined up at their battery docking stations on a crisp autumn day in Rochester, Mich. They're all charged up -- literally. Aaron Bragman, an analyst with IHS Automotive, gets behind the wheel of a silver Volt. He's among successive waves of journalists, bloggers and analysts who are driving Volts on all-day road trips through southeast Michigan. They'll log a total of 15,000 miles. Like Bragman, most will give the car high marks. It's comfortable, fun to drive and quiet. There's tons of torque -- car people love torque -- and there's all that cool stuff on the dash and in the power train. "The level of technology in this thing is surprising, even to those of us who've seen high-tech cars," Bragman says. "You pop the hood and it is packed." 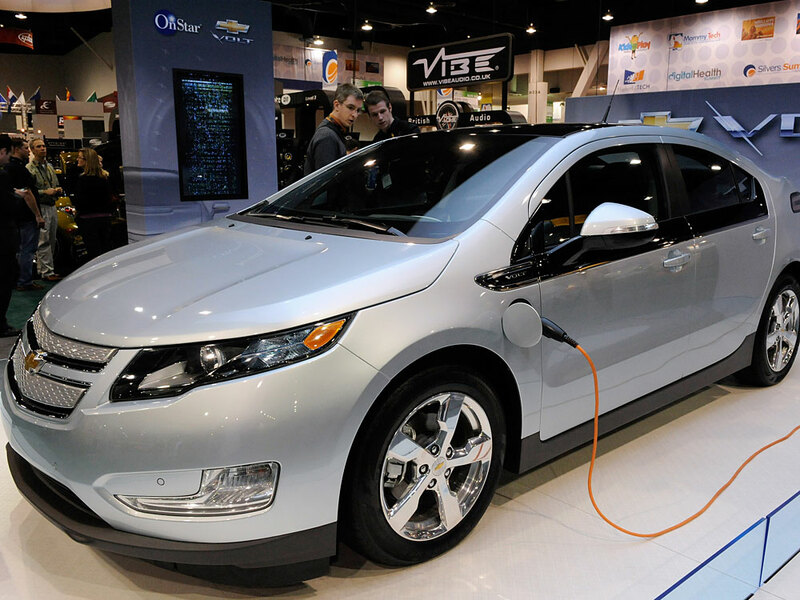 The Volt runs on its battery alone for 25 to 50 miles, depending on how and where you drive. After that, the internal combustion engine kicks in to power the electric motor. "You barely even know the engine comes on," Bragman says. Since most people drive fewer than 40 miles a day, it's possible to drive the Volt just like an electric car, most of the time. But if you need to go a long distance, you can do that too, using gas. It's as unique as the Prius hybrid was 13 years ago. Bragman says it's entirely possible the Volt could be to GM as the Prius is to Toyota. "This is really the new halo vehicle -- the new green, gotta-have it vehicle," he says. But Toyota already had an excellent reputation before Prius, and GM ... well not so much. Bragman says that means the Volt has to be perfect. With this much advance fanfare, every little flaw will hit the blogosphere before you can say Chevrolet. GM executives are expressing no doubts, though. Volt marketing chief Tony DiSalle says this one car could lift the whole company. "When consumers see that, they quickly go to the notion that you are smart enough to design and engineer and manufacture a vehicle that's this capable and this innovative, [and] you just must make better vehicles overall," he says. What the car won't do is make lots of money, at least at first. GM has put more than $700 million into the program, and it could take a long time to get that back. Most analysts say Prius didn't make money for Toyota for nearly a decade. But by luring people to Chevy dealerships to see the Volt, DiSalle says, GM might just sell a few more of its other vehicles. "People would come in to look at it, and not necessarily be in the target for a Volt -- and become extremely interested in a Cruze," he says. While GM strategizes, some analysts remain highly skeptical. Brett Smith, with the Center for Automotive Research, says Prius has already proven itself in the marketplace. Toyota has sold more than 880,000 of the hybrid cars in the U.S.
Smith says it's way too soon to speculate on Volt sales or any halo effect. "They're learning about the market, they're learning about the consumer, they're learning about the technology," he says. "Give it 10 years, look back and I think it will be interesting. But right now, it's a great experiment." GM isn't acting like it's all an experiment. Just as Toyota launched the Prius slowly, GM will make only 10,000 Volts in the first year. They'll begin to show up in select showrooms in Austin, New York, Washington, D.C., and California in December.